Press brakes, or brake press, are a kind of machine for bending sheet. 2-PPEB series press brakes are composed of two PPEB series CNC hydraulic press brakes. They use the advanced hydraulics and electronics technology and multi-axis configurations are available to satisfy a broad range of bending needs. The tonnage of the machine for bending sheet is 160 tons to 8000 tons and width of plates to be folded could be 4 meters to 24 meters. 1. 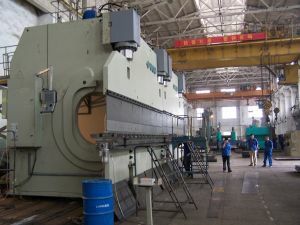 2-PPEB series press brakes, as the name indicates, consist of two PPEB series CNC hydraulic press brakes. 2. This type of bending machine adopts the latest technology from Belgium LVD company. 3. With precise control from reliable CNC control system and electro-hydraulic servo system, our machine for bending sheet can produce products with high quality. 4. Total numerical control contributes to easy operation, simple maintenance and convenient adjustment. 5. These CNC hydraulic press brakes also possess concise structure and beautiful shape. HUBEI TRI-RING METAL-FORMING EQUIPMENT provides all kinds of CNC Hydraulic Press Brake in China. 2-PPEB series CNC Hydraulic Press Brake is applied with the latest technology from Belgium LVD Company. YSD occupies more than 80% market shares in the field of bending machine in China. For more information, please contact us.